Brulee has the cobby Persian body with short legs. 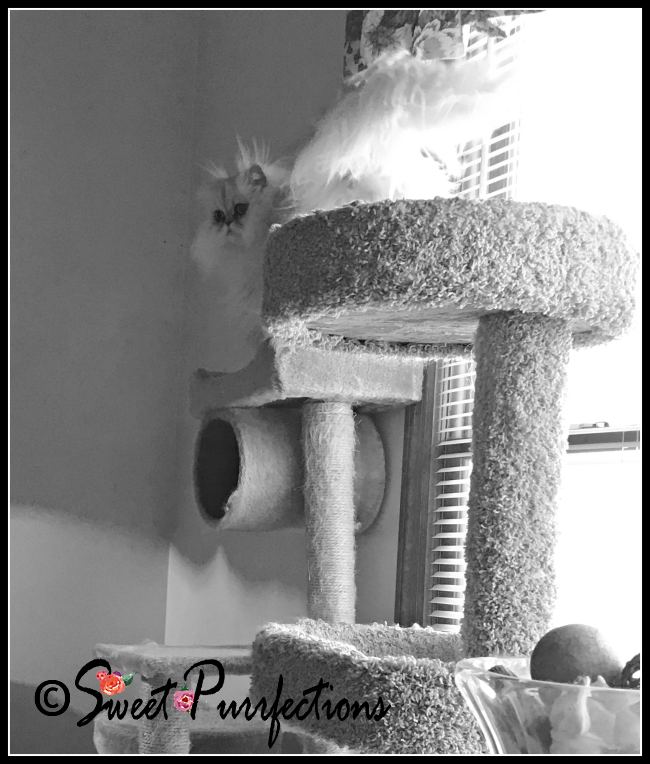 One wouldn't think she'd love to jump and climb, but her favorite place to rest when the sunbeams are coming through the window is in the top of the cat tree. She's claimed this place as her own and Truffle doesn't dare try to get up there. Interestingly, Truffle prefers resting on the lower levels. Mom Paula had to keep the old cat tree because the design of the new tree doesn't allow for Brulee to jump down easily. She prefers climbing down on diagonal levels to get to the bottom. Mom Paula is having her second cataract surgery today. Even though she had the first one in April and it went well, she's still nervous. Special purrs are appreciated. I'm sending purrs to your human, girls! I'm sure she'll do fine, but I know she needs the support. Sending purrs to Mom Paula. We like different levels too. Sending lots of purrs to Mom Paula that all goes well today. Good luck to Mom Paula. We'll all be sending her purrs today. I hope everything goes well for your mom today. I hope everything goes okay! Lucky purrz to your mom as in good luck. TW aced her's so anyone can do it. She chatted up her surgeon through the whole procedure. Mom Paula and her surgeon talked about the Gamecocks throughout her surgery! Brulee is a cutie. I hope surgery went well. Hop all goe well for mom Paula. Ending purrs prayers. That Is a great cat tree. Purrs and prayers fo mom Paula. Hope all goes well. That is one great cat tree. Purrayers that Mom Paula's surgery goes well !